Welcome to the Crazy Crafters Blog Hop with our Special Guest stamper, Bibi Cameron - we are thrilled to have Bibi join us this month and so excited to CASE (Copy And Selectively Edit) any project that has been created by her . We hope you find great inspiration from the projects. This is the card by Bibi that I have chosen to CASE. 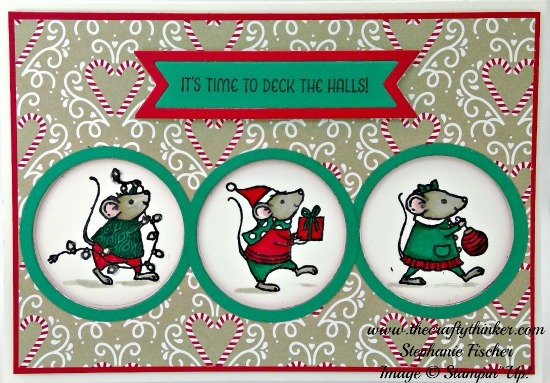 I decided to use a similar layout to create a Christmas card with the Merry Mouse stamp set. The base card is an A5 piece of Thick White Cardstock folded in half. I cut a layer of Real Red cardstock and added a slightly smaller layer of Candy Cane Lane Designer Series Paper. I then used the layering circles framelits to cut the circular holes in the layer, laid the piece on top of the card base and lightly marked the positioning of the holes with a pencil. I used a Basic Black Stampin' Write marker to ink up one image at a time on the stamp and placed the images within the pencil drawn circles using my faithful Stamp-A-Ma-Jig to help with positioning. I then used Stampin' Write Markes in Real Red, Emerald Envy, Sahara Sand, Crumb Cake and Pink Pirouette to colour the images along with a few touches of gold and clear Wink of Stella. I adhered the top layer over the stamped card front with Stampin' Dimensionals and then added circular frames cut from Emerald Envy cardstock. The greeting is stamped in Basic Black ink onto Emerald Envy cardstock. I used the banner die from to cut it out and then cut another with Real Red cardstock. I wanted to pop the banner up on dimensionals, so I glued the pieces to some Think Whisper White cardstock and trimmed around the edges.